The above size chart reflects the approximate measurements for the garment. The chest size is not your chest size but the chest measurement of the shirt. Most men are normally safe purchasing a shirt that is approximately 6" larger than their chest measurement. You will find that this will generally work out to be your "normal" size. Not sure of your own chest measurement? Your "normal" size will usually be correct. Please call us at 888-900-1950 or e-mail with any sizing questions. The most popular Ed "Big Daddy" Roth monster was Rat Fink. Rat Fink started as a drawing that Ed had put on his refrigerator. Ed "Big Daddy" Roth was a genius at designing cars, but it was Rat Fink that brought him fame. 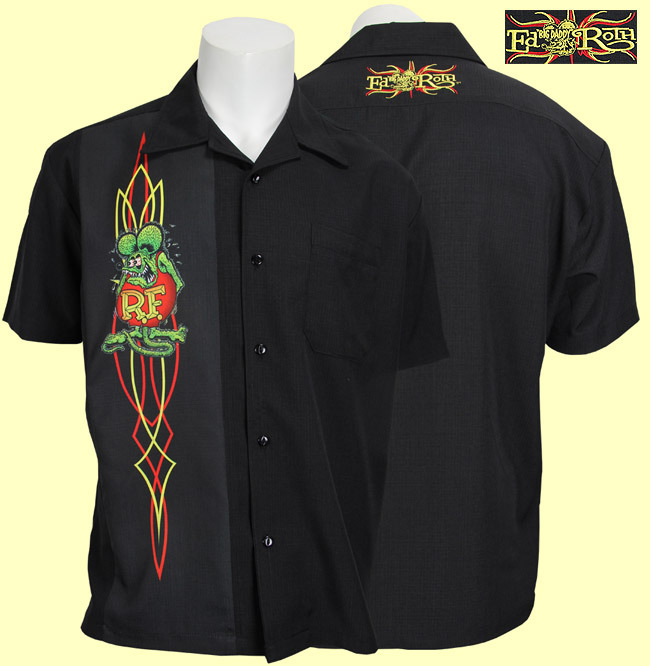 This shirt is part of Steady Clothing's Officially licensed Rat Fink Collection. It is a classically styled black single panel shirt with a chest pocket. The charcoal gray panel features a beautiful sublimated print featuring a full color version of Rat Fink over pinstriping. The upper yoke of the back of the shirt features an embroidered Ed "Big Daddy" Roth logo. This shirt is a must have! !